The tensor fascia latae, or TFL, is a well-known hip muscle among healthcare professionals and rehabilitation specialists. Because of its function, this muscle may be responsible for pain and dysfunction in the lower extremities, pelvis and spine. Research studies conclude however, that this muscle is poorly understood and needs further examination. Furthermore, the majority of research which has been already conducted have in fact simplified the accurate anatomy of, not only the TFL, but also its anatomical relationship to the iliotibial band, or ITB. Available research describes that the muscle has both a bony insertion onto the femur and a fascial insertion onto the iliotibial band, or more specifically, onto the region of the middle longitudinal layer of the fascia latae of the thigh, the iliotibial band. Early studies perceived the ITB to be a ligament that connected the ilium with the knee in order to help maintain the balance of the body while in motion or when standing. Later studies demonstrated that human beings are the only mammals to own a distinct fascial lateral band down the thigh, indicating that the ITB may play a role in bipedal balance and stance. Other studies demonstrated that the fascia latae of the thigh contains a multifaceted array of layers which all attach. The middle longitudinal layer, or MLL, of the fascia latae is a thick, connective tissue that originates on the iliac crest and extends downwards into various insertions. A large part of the MLL blends with the inner transverse layer of the fascia latae and is introduced directly onto the femur. The middle longitudinal layer also has superficial fibres that extend all the way down and insert into the knee. Anteriorly at the hip, the MLL surrounds the TFL to ensure the muscle is effectively joined between the superficial and deep middle longitudinal layer. It also contains fibres which directly combines the superficial fibres of the gluteus maximus The MLL is joined in part to the gluteus maximus and in part to the TFL. As well as being enveloped by the middle longitudinal layer, some of the distal fibres of both heads of the TFL then insert into the MLL. The anteromedial fibres of the TFL fuse with the MLL and course down the thigh to introduce onto the lateral patella retinaculum. This is believed to influence the position of the patella in relation to the femoral trochlear groove. Nevertheless, none of these tissues cross the knee joint, therefore they have no effect on motion at the tibia. According to research, the primary function of the muscles and tissues appears to be at the hip. Some of the fibres of the posterolateral tensor fascia latae together with the tissues of the gluteus maximus, contribute function for the MLL and attach all the way down onto the lateral tubercle of the tibia. These do cross the knee joint and may ultimately help stabilize the pelvis and the lower extremities. Essentially, the MLL travels down the thigh and heavily combines with the inner transverse layer of the fascia latae as it is largely developed and dense within the upper third of the thigh. These transverse fibres run obliquely to anchor strongly to the femur, making up the deep and thick intermuscular septum of the femur. The septum effectively forms an osteo-fascial wall between the anterior quadriceps muscle group and the posterior hamstring muscle group. Fibres from the inner transverse layer also allow the superior fibres of the gluteus maximus to develop an ascending tendon. The part of the tensor fascia latae that did not combine with the middle longitudinal layer of the tissue also combines with this rising tendon to insert directly onto the intermuscular septum and the femur. In other words, the majority of the TFL indirectly inserts onto the femur via the ascending gluteal tendon and indirectly via the blending of the MLL to the thick transverse layer. Further down the thigh, the iliotibial band continues as a thickened section of the fascia latae, creating the fascial barrier between the anterior quadriceps and the posterior hamstrings. It then completely envelops the thigh, holding to the distal lateral femoral shaft through strong obliquely directed fibrous strands and follows the patellar retinaculum. Because these fibrous tissues divide the ITB into a proximal tendinous portion and a distal ligamentous portion, it’s been concluded that the tensor fascia latae has very little involvement in the mobility of the tibia and knee and its primary function is directed at the hip. The main function of the anteromedial fibres is to flex the hip during open kinetic chain movements, such as hip flexion over the swing phase of gait, as confirmed through EMG and electrical stimulation experiments. The muscle is restricted upon heel strike which suggests that the muscle is required to be inactive to allow hip extension to occur during stance phase. The muscle is most active during the acceleration phase of running which also demonstrates its main role as a powerful hip flexor. During pure open kinetic-chain movement, the AM fibres are most active in hip flexion movements as well as in abduction movements. It becomes restricted though, if the hip is externally rotated whilst abducting. This should be an important consideration when a healthcare professional is recommending specific hip rehabilitation exercises for the gluteal muscles and other hip external rotators. The posterolateral fibres are most active during the stance phase of gait. This suggests that the muscle acts as a major hip stabilizer during single leg stance as it activates its role as a hip abductor. In this process, the superior portion of the gluteus maximus is also active during walking phase. Considering that the PL head has fibres that join the tendon from the superior gluteus maximus, this proposes that the posterolateral fibres and superior gluteus maximus cooperate to control the stability of the pelvis during stance phase. Both the tensor fascia latae and gluteus maximus apply their role as a hip muscle through the contribution they have with the MLL, the deep transverse layer of the fascia latae and the intermuscular septum. They effectively insert onto the femur through this complex system of fascia and are considered muscles which begin at the pelvis which are introduced onto the femur. In pure open kinetic chain movements, the PL, or posterolateral fibres, are active in all hip internal rotation movements and in abduction movements. Similar to the AM fibres, the PL fibres remain restricted if the hip is abducting whilst in external rotation. A majority of the comprehensive studies examining the role of TFL in relation to the movements of the knee and the stability of the patella find it challenging to identify a direct function for the TFL in knee function. It almost certainly does not contribute to knee extension, flexion or rotation. As a result, all previous descriptions of the TFL being a synergistic knee extender with the quadriceps or an externally rotator of the tibia can almost certainly be rejected. It’s also been concluded that the TFL does not play an active role in pulling the patella laterally. The most likely role the TFL has in knee patella stability is indirectly, through maintaining the tension in the fascia latae and the distal portion of the ITB that combines with the patella retinaculum. Several studies have demonstrated that the tensor fascia latae also functions to maintain fascia tension during movement. This is primarily due to a complex arrangement of fascial planes of various thicknesses which have development over the thigh. It has a loose anterior and posterior layer which cover the quadriceps and hamstrings. The loose anterior superficial layer of the TFL would gather during knee extension movements if there did not exist some manner of tensioning system for the fascia to maintain the fascial envelope. In the same manner, the posterior fascia latae would most likely gather during knee flexion movements. Based on their anatomical arrangement with the fascia latae, the muscles which can maintain this fascial tension during knee movements include the TFL anteriorly and the superior gluteus maximus posteriorly. The TFL must then become slightly active during knee extensions to progressively shorten the fascia upwards whilst the knee is extended, to prevent the anterior fascia from creasing and twisting. Similarly, the gluteus maximus can maintain fascial tension during knee flexion movements. One of the most extraordinary roles assigned to the ITB is the role it has in reducing the bending and tensile force on the lateral femur. Humans walk on two feet, which means that during a section of the gait cycle, they are in a one-leg stance. This can create large lateral femur tensile forces and medial femur compression forces which, if not properly monitored, could develop a varus effect of the femur and essentially bend the femur. During a study, researchers investigated the function of the ITB and concluded that the varus bending forces on the femur could be partially relieved by tensioning the iliotibial band. Other studies analyzed the stresses on the femur caused by the varus force on the bone and also found that by increasing the tension in the ITB, the lateral tension force and the medial compression force on the femur would both ultimately limited. 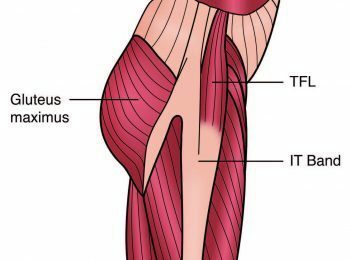 The study also suggests that the TFL and gluteus maximus may add further tension to the ITB and lessen this lateral tension force on the femur. For all the TFL issues that affect many individuals, almost nothing exists in the literature that highlights the role this muscle has in dysfunction. All theories and ideas are based on clinical reasoning and assumptions. The most interesting observation regarding TFL complications is the role it has in causing hip internal rotation/flexion during the stance phase of gait. Frequently, many individuals who report lower limb injuries caused by overuse or low back and sacroiliac joint pain are commonly diagnosed with an exaggerated hip flexion/internal rotation position during the functional movements of a single extremity. The stance suggests an internally rotated and flexed position. This complication then develops what is known as a valgus collapse at the joint of the knee, directly affecting the Q angle of the knee. With an increase in the Q angle, the patella often tends to drag laterally and compress against the lateral femoral condyle. This may then lead to patellofemoral pain at the knee. This is believed to occur because the TFL maintains the stability of the pelvis during one-leg stance by beginning its abduction role. The tensor fascia latae may also display its hip flexion/internal rotation role. The gluteus maximus, and other hip external rotators, should provide and equal opposite external rotation/extension role. The gluteus medius and minimus primarily function on the hip joint by contributing a compressive and stabilizing role. These work little to assist in maintaining a stable pelvic position. Instead, this role is assigned to the tensor fascial latae and gluteus maximus. The TFL is a significant muscle in pelvic dysfunction because it has the greatest mechanical advantage to influence the pelvis and hip joint. It is the most anterior muscle at the front of the hip, as a result, it’s believed to have the greatest leverage advantage to encourage a flexion posture or an anterior tilt of the ilium. Observing the hip from the front, the tensor fascia latae is also the most lateral muscle on the hip. Therefore, it has the greatest leverage to affect abduction of the hip. This explains how such a small muscle can have such a large influence. Furthermore, because the complex structures surrounding the lower back, buttocks, hip/pelvis and leg can become directly affected causing pain, irritation and inflammation as a result of TFL complications, other structures of the body can be greatly affected as well. The sciatic nerve is the largest single nerve found in the body and it runs through, the lower back, buttocks and leg. The nerve is tightly surrounded by muscles and other tissues. When these surrounding tissues are altered, the sciatic nerve can be easily compressed, causing symptoms of sciatica. Sciatica is described as a set of symptoms rather than a single condition. The most common symptoms of sciatica include: lower back/buttock/hip/leg pain, burning and tingling sensations, and numbness. While the following tests can be used to determine the presence of TFL complications, a proper diagnosis can help differentiate whether the individual is experiencing sciatica as a result of tensor fascia latae dysfunction or due to another serious complication. Chiropractors are healthcare professionals who specialize in musculoskeletal and nervous system injuries and conditions. Chiropractic care offers a form of alternative treatment which uses spinal adjustments and manual manipulations to carefully diagnose a variety of injuries or conditions and decrease or eliminate the symptoms of sciatica which may also be associated with TFL. In addition, an individual may follow through with chiropractic treatment to also find relief from their tensor fascia latae dysfunction after determining its presence with the next set of tests. To properly assess the tightness in the TFL, utilizing an Ober Test or a Thomas test can help. The individual must be positioned on their side with the unaffected side facing down. The pelvis and spine should be in neutral alignment with the bottom leg flexed for support. The uppermost leg is extended above the horizontal. The hip is then laterally rotated and extended, as long as no lumbar extension occurs. The individual must actively flatten their waist towards the floor and hold their leg in slight abduction and lateral rotation. The individual will then be instructed to slowly and carefully lower their leg towards the floor until the tensor fascia latae and the iliotibial band hangs on the greater trochanter and cannot lower any further. The key to an accurate test is to not allow the pelvis to move, either into a lateral tilt, anterior tilt or rotation. As the leg lowers, the hip should not flex or medially rotate. It’s essential for the individual to maintain the laterally rotated position of the hip. Ideally, the leg should lower into at least 10 to 15-degree adduction without losing the proximal control of the pelvis or hip. The tensor fascia latae and iliotibial band may lack elasticity if the leg does not adduct sufficiently. On a plinth, the individual should lie supine with the untested leg held in hip flexion. The tested leg is then forced into extension and adduction. If the tested leg is unable to attain a horizontal alignment and is held in flexion and/or abduction, this is indicative of tightness in the tensor fascia latae. To manage the overactive or tight tensor fascia latae, 2 important criteria must be met. First, it must be stretched and then, it must be massaged and manipulated. The most effective stretch for the TFL is the knee-down hip flexor stretch. To stretch the left TFL, first, the individual should kneel on the left knee with the right leg at 90-degrees hip flexion and knee flexion. Second, the individual must push their left hip forward until the slack is taken up. Third, by placing the hands on the right thigh, the individual will follow by twisting the trunk around to the right whilst the pelvis remains facing forward, inducing an external rotation of the hip to add to the rotation component of the stretch. Then, if the individual has any slack left, they must push their left leg outwards. Finally, the individual must isometrically contract the right hamstring by attempting to drag the left heel backwards. To stretch the right TFL, the same procedures should be followed but using the opposite leg. To self-massage or trigger the TFL, the individual should lie on their side and place a trigger ball/Muscle Mate/Posture Pro under the tensor fascia latae in order to apply gentle pressure. The hip, knee and ankle should remain in a straight line with the body. 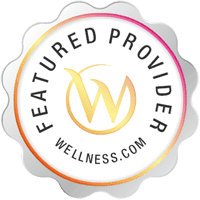 This can be performed as a rolling type movement or as sustained pressure to relieve the trigger points within the muscle, ultimately helping to reduce the painful symptoms associated with TFL dysfunction, among other serious complications which may need medical attention as soon as possible.